For months I’ve been proactively trying to cut down on the number of RSS feeds I’m subscribed to because, these days, I rarely get a chance to check more than a dozen of them each day anyway. There’s something about hitting the 200 unread posts per blog limit on bloglines that fills me with dread – and leads to bizarre incidents where I have to close my eyes and click on feeds randomly because I just can’t face missing all that content knowingly. I did describe those as “bizarre incidents”. “As usual for a Sunday, I woke up this morning listening to Julian Worricker’s programme on Radio Five Live. Today, in place of the Five Live Report, was a one-off programme about “Blogging in the UK”. “Oh, that’ll be interesting,” I thought, so I stayed in bed and waited for it to come on. I was to discover that the programme wasn’t about blogging at all. Blogging in the UK was originally part of ‘Your Five Live’, which I mentioned in my post about user generated content. Specifically, it was a feature of Five Live’s Breakfast programme. The idea was to take a day during ‘Your Five Live’ week — the 22nd of January — and encourage as many first time bloggers to write about their day. The results are predictably awful, reinforcing the stereotypes about how bloggers are just people who write about what they had for breakfast. 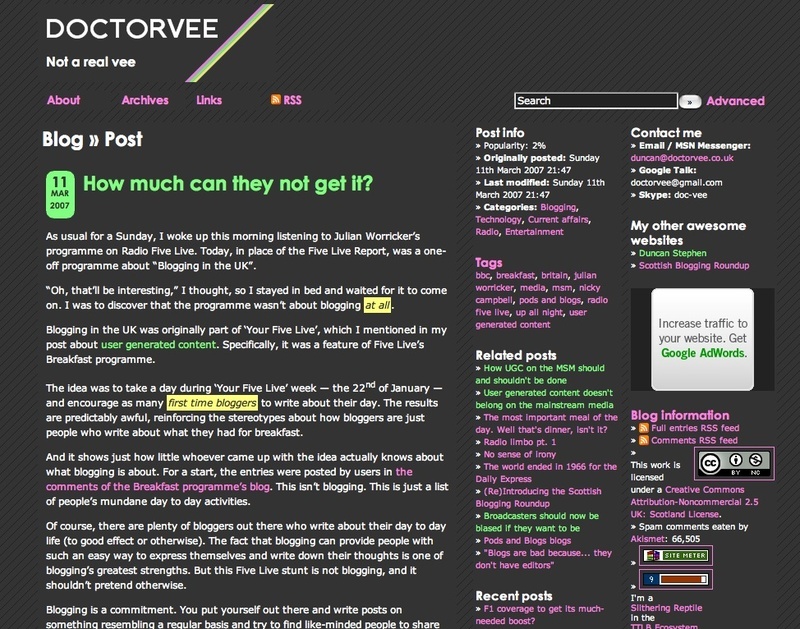 DoctorVee reaches parts that other blogs don’t touch with posts like User generated content doesn’t belong on the mainstream media , Blogging takes no time at all , Broadcasters should now be biased if they want to be and Warning: This is a navel-gazing post about blogging, and they are the worst. Wow, thanks for the kind words! I hope you aren’t too disappointed in my future posts which probably won’t touch on this issue very often! I’m worried that I might come across as a bit of a grumpy old (young!) cynic in those posts that you’ve linked to (from what I can remember of them anyway). Certainly with the most recent two posts in your list, I was very negative about what I was hearing on the radio and television. I realised this when Chris Vallance linked [http://www.bbc.co.uk/blogs/podsandblogs/2007/02/live_blogging_beyond_broadcast_1.shtml] to my post saying I had very strong views. Now I am cutting as well! I didn’t mean to be! I like a lot of what goes on and I think there is a lot of potential in the area. UGC is bound to come in useful for all sorts of stories you see in the mainstream media. It’s just that they need to know when it is the right time to use it. Most of the time it is just empty bangwagon-hopping.